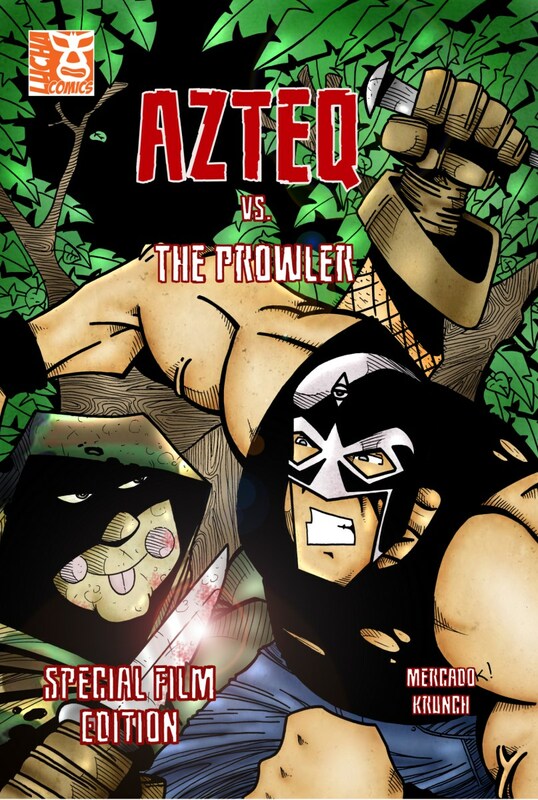 Pullbox Reviews: Azteq vs the Prowler- Action off the top rope! A serial killer is on the loose, and Detective Longley of the Fort Worth, Texas Police Department is looking for answers. The victims that have been found have all been men, their bodies left behind, while women have disappeared without a trace. Whatever the Prowler’s motives might be, his single biggest mistake may have been abducting the beautiful young Ivie. If the he’d been paying more attention to the details, he might have known that Ivie was the girlfriend of a high flying young Luchador named Azteq. The Prowler may be able to evade the police, but when Azteq joins forces with Detective Longley, his prospects for continued killing and kidnapping are looking a little dim. Sunday mornings were a bit of a mix when I was growing up. While Saturday mornings provided the more or less kids only entertainment of cartoons from 7am to 11am, Sundays were reserved for old flicks and movie serials. With a major focus on horror, action, and westerns- the occasional Flash Gordon thrown in to keep things interesting- kids and grownups got to settle in on the couch side by side for some healthy escapism. It was on one of those days that I was introduced to the outlandish world of Lucha Libre in the movie Santo versus the Vampire Women (Santo vs. las Mujeres Vampiro), in which Mexican Luchador Santo jump kicked his way through the forces of darkness. The tradition of the Luchador, the mysterious masked wrestler, lives on to this day and seems to be seeing a bit of resurgence in comicbooks. I reviewed the supernatural tongue in cheek action title Blood Brothers last month, and now I’ve had the great luck to have been contacted by Roberto Mercado. Originally, Mercado had asked me to plug some of his upcoming work and after some back and forth emails and Twitter, we’ve parlayed that into me getting my hands on a couple preview copies for review. Now when it comes to certain kinds of comicbook stories, I may be an easy sell. 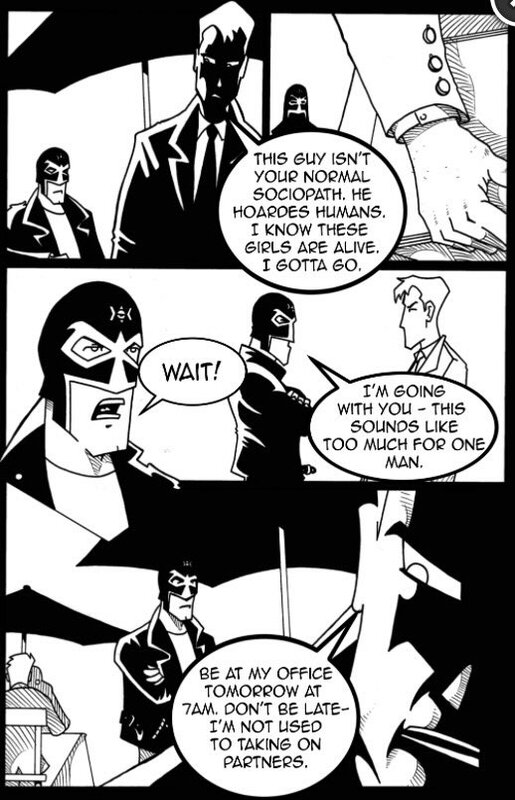 I’ve been a fan of pulp action stories since I was a kid, and I’m happy to say that stories of Luchador superheroes battling evil fall well within that category. Fortunately, Roberto Mercado has provided an extremely readable example to work with. Young Luchador Azteq is a dynamic figure who upholds the greatest traditions of the masked warriors who’ve come before him. In the ring, he’s agile and strong, and outside of the ring he’s a defender of the helpless. Mercado provides Azteq ample opportunity to express his beliefs, when asked why he never takes off his mask in public, but never goes so far over the top into what could be a veritable minefield of cheese and corniness. He writes his dialogue with more of an eye toward letting the action speak for his characters, and for the most part it works very well with only a couple points of the story falling into more confusing territory. In the end, though, the story does get told and is wrapped up with a pretty satisfying climax and a promise of more potential team ups for Longley and Azteq. Being a comicbook relying heavily on its action elements, the storytelling fell to both the writing and the artwork. In the latter case, artist Kundo Krunch carried his share of the workload with style. 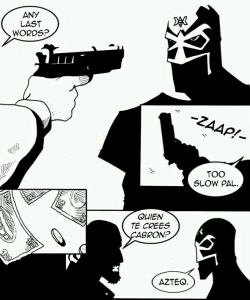 Being a black and white comic, Azteq vs the Prowler could have very easily gone to pieces in the images. A black and white title will occasionally go too far in its illustrations, excessive detail serving only to confuse the action on the page, however Krunch (Cap’n?) nailed it. His characters are clearly rendered, the line work sharp and clean. Some of the female characters, primarily the abducted women, may come across as being too similar in appearance and therefore difficult to tell apart except for their wardrobes. That resolved itself when my crime drama television experience kicked in and I was reminded that serial killers often stick to a “type”. Where I thought Krunch really shined was in his action sequences. 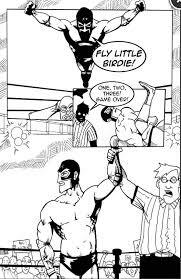 Bearing in mind that the wrestling identified as lucha libre is generally more high flying and acrobatic than its North American relative, I thought the fight scenes in this book were great. Azteq’s movements were drawn with an eye toward dynamic action, not at all stiff or clunky looking. Azteq vs the Prowler has the distinction of not only being a blast to read, but is also an upcoming movie written by Roberto Mercado and starring Aski the Mayan Warrior (Azteq), Chanel Ryan (Ivie), Robb Hudspeth (Det. Longley), and Mike Knox (the Prowler). It’s a movie that I’m looking forward to checking out, and I hope that some of my tens of readers might do the same. Anyone interested, take a look over at AzteqvsProwler.com for more info, including full cast, production stills, and insider info. Having put the finishing touches on this article, I’m gonna go spend some quality time getting reacquainted with the live action flash and excitement of Lucha Libre… I think I remember seeing a show on Netflix that looked promising. Amazing. It is a great read. Robert Mercado as the author has a great vision for depicting these characters. A+++++++ please make more graphic novels. A must read for anyone who loves to read. Easy read and looking forward to seeing more things from this author. This author deserves credit for creating something like this which it is a very hard task to do. 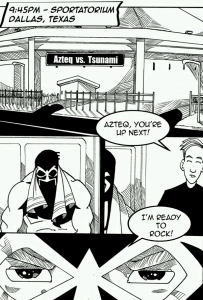 I just bought an “Azteq vs. The Prowler” comic book on Ebay and love it! A masked wrester versus a serial killer a la Jason (Slasher) is a very interesting an innovative concept. That’s why I buy and support Indie comics.